The factory Yamaha MotoGP team has admitted it was not as competitive as it expected in Friday practice ahead of the Spanish Grand Prix at Jerez. Jerez has traditionally been a happy hunting ground for Yamaha, but the works team endured a poor Spanish Grand Prix last year - with both Maverick Vinales and Valentino Rossi struggling for grip on their way to sixth and 10th. After a breakthrough at Austin last month, Yamaha was optimistic heading to Jerez - despite electing not to join its rivals for any of the test days at the circuit since it was repaved last year. 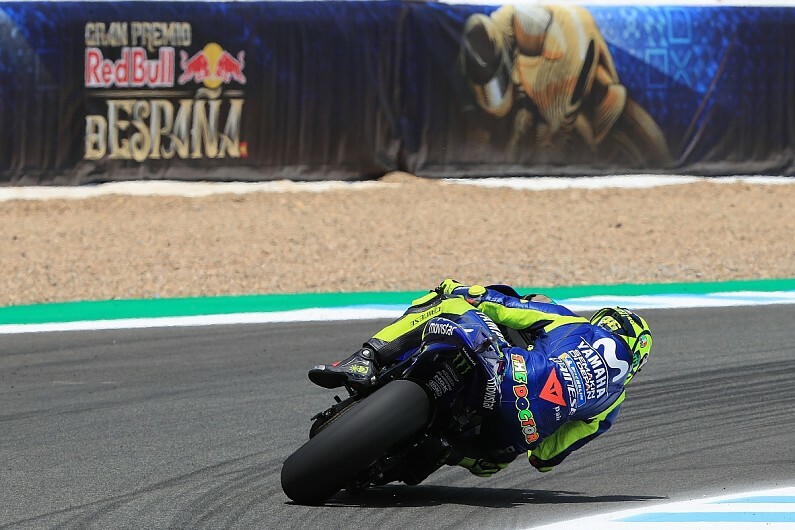 But as the Spanish GP weekend kicked off, the works team's pace has been underwhelming, with Rossi ninth and Vinales 12th on combined lap times after Friday. "We knew that we would have a bit of catching up to do on the first day of riding in Jerez, because we didn't attend the test here earlier this year, but we expected to be doing better by this stage," team director Massimo Meregalli admitted. "Ultimately, when we put on the soft tyre to do the time-attack, our expectations were not met. "We have to improve the speed and the pace - the latter is the most important for the race." Rossi, who was just two tenths off the pace in sixth in practice one but slumped to ninth place in the afternoon, admitted Yamaha was "suffering" again at Jerez. "A difficult day, especially the afternoon," he said. "Because this morning with less temperature I feel good with the bike, with the tyres, and FP1 was not too bad. "But in the afternoon with more temperature we suffer more. "I'm not very happy about the balance of the bike, we have to modify the general balance, the general feeling, but especially we suffer with the tyres, because in this track, the new asphalt is better but you wheelspin a lot, and in this situation we suffer. "After some laps we lose grip and our pace is a bit more slow compared to our opponents." Rossi predicted a "hard" weekend for his team, adding: "It's always great to ride in Jerez, I like it a lot, it is better than last year, but looks like the top five, top six are stronger." Vinales, who placed in the lower part of the top 10 in both sessions but is currently on course to miss out on an automatic Q2 spot on combined times, said: "Today I didn't have the best feeling. I wasn't feeling well during FP1 and FP2, it was difficult. "In Austin we improved quite a lot, but since coming here the problems started again. The bike is moving around a lot, so we have to keep working and stay focused. "Vale seems to be having the same problems, our lap times are quite similar. We have to find a solution that works for us."